The National Chairman of the Peoples Democratic Party (PDP), Mr Uche Secondus, has challenged the Minister of Culture and Information Alhaji Lai Mohammed to be ready to prove his allegation that he collected N200m from the purse of the National Security Adviser (NSA). 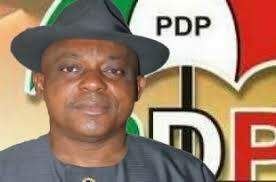 Secondus gave the threat in a statement issued by his spokesman, Mr Ike Abonyi, on Friday in Abuja. He said that his attention was drawn to a press conference addressed by Mohammed on March 30 in Lagos claiming that he (Secondus) collected N200m from the office of the former NSA. The PDP leader is challenging Mohammed to be ready to establish his allegations in court immediately. “For the purposes of some gullible public, Prince Secondus never collected any money from the NSA under any guise. Also listed at the news conference by Mohammed were former PDP Financial Secretary who allegedly collected N600 million from the same source on Oct. 24, 2014. “Then National Publicity Secretary Olisah Metuh, who is on trial for collecting N1.4 billion from the office of then NSA. “Dr Raymond Dokpesi, Chairman of DAAR Communications, on trial for taking N2.1 billion from the office of then NSA. “Former SSA to President Jonathan, Dudafa Waripamo-Owei, on trial over N830 million kept in accounts of four different companies. “Former President Jonathan’s Cousin Robert Azibaol, – on Thursday, a Federal High Court ruled that he has a case to answer for collecting $40 million from the office of then NSA,” Mohammed also listed as part of the response to an earlier challenge by the PDP asking the federal to name the country’s looters. Also, the PDP in a statement by its National Publicity Secretary described the teasing list released by the Federal Government as hollow and laughable.